We all know the feeling: It’s 11:25 am, and you’re just getting immersed in your most challenging work. Your fingers are tapping away, your thoughts are fluid, and you’re writing faster. The right words are coming more easily than usual, and you’ve almost completely lost track of time. You sigh and head to the conference room, knowing you’re in for another unnecessary meeting. No one’s prepared, you feel like you’re wasting 30 minutes, your flow is disrupted, and all of this could’ve been solved with an email. 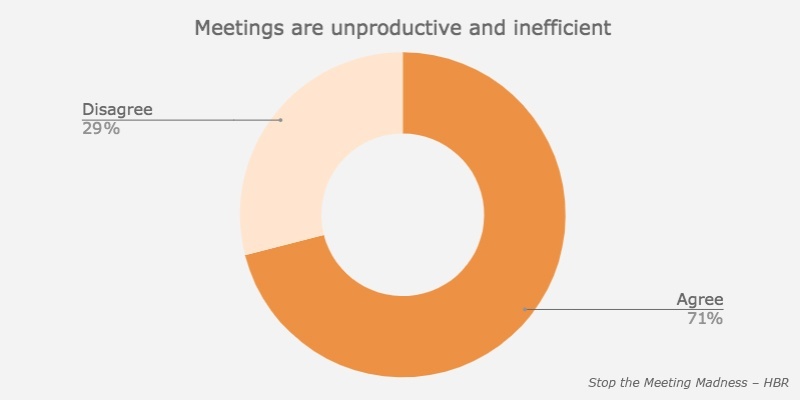 Unproductive meetings have become a chronic complaint in the workplace. The number of meetings has doubled over the past 50 years, as organizational structures have become flatter and less hierarchical. Workers in the United States attend about 11 million meetings each day at the estimated cost of $37 billion annually. 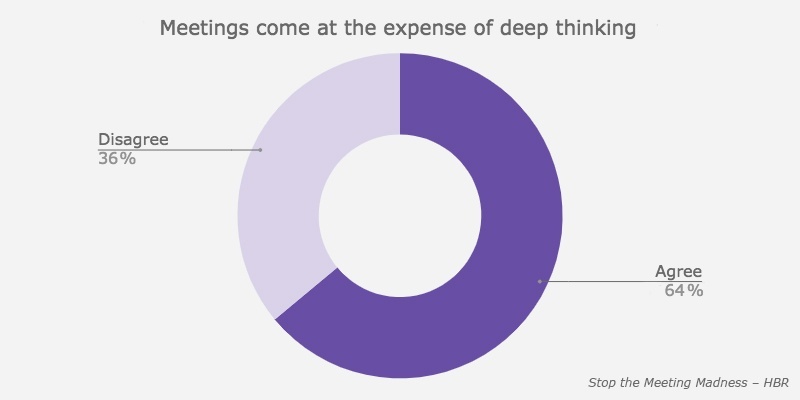 Senior managers attend nearly 23 hours of meetings every week, and people working for large organizations tend to have more meetings than those in smaller ones. Since it takes the brain almost 25 minutes to refocus on a task after an interruption, meetings can be an inhibitor to completing deep work, a phrase used by Dr. Cal Newport that means being able to focus on a challenging task without interruptions. According to “The Science and Fiction of Meetings,” a compilation of meeting science research published in MIT Sloan Management Review, ineffective meetings have a negative impact on job satisfaction and employee morale. Employees who attend poorly-run meetings are stressed, dissatisfied, and more likely to leave their jobs. Despite all the complaints, meetings are essential to collaborative work. Effective meetings help to resolve conflicts, build relationships, provide learning opportunities, and improve communication. When meetings are facilitated correctly, they provide the right energy to move projects forward. In fact, it’s often necessary to collaborate in groups to arrive at the most creative solutions. Meetings can also be more conducive to certain work styles. 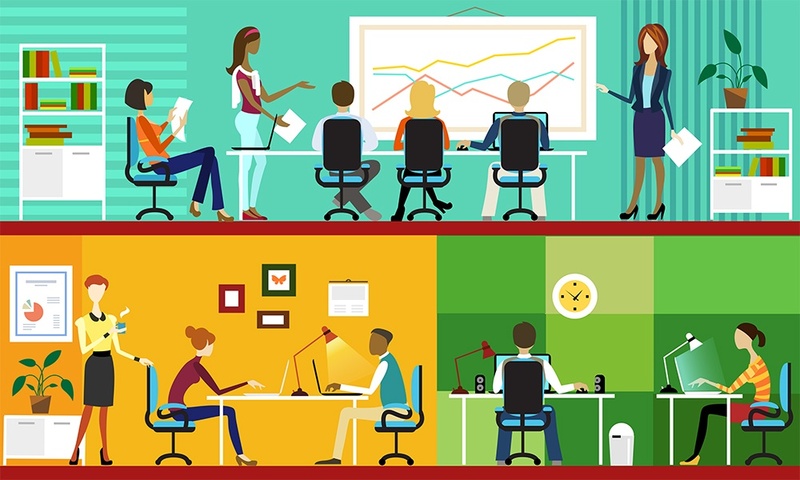 According to a study on meetings led by Dr. Steven G. Rogelberg that was published in the Journal of Applied Psychology, if an employee is task and achievement-focused, meetings decrease job satisfaction and disrupt productivity. If an employee is less accomplishment-focused, they tend to like meetings. This may be because meetings can provide structure to an unstructured day and provide the opportunity to socialize. Research like “The Science and Fiction of Meetings” shows a clear link between productivity, satisfaction, and meetings. 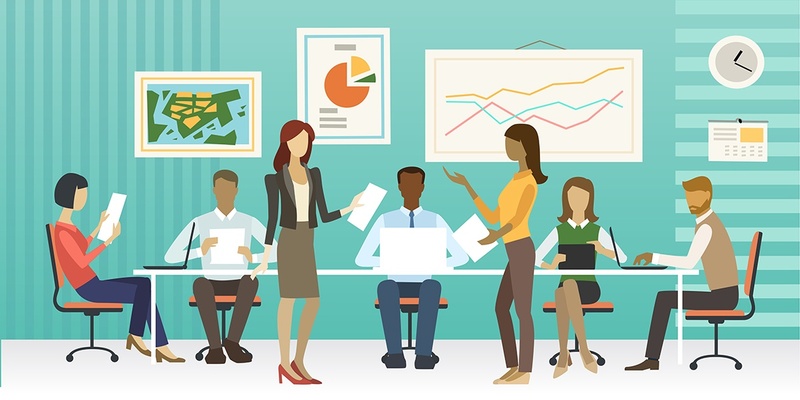 Organizational science and psychology research has given us more insight into how to enhance meetings to positively influence organizational culture and engage employees. If you’re having trouble creating a plan, the meeting may not be necessary. Meetings should be scheduled for the minimum amount of time needed. If you reserve an hour, the meeting will take an hour. According to Dr. Steven G. Rogelberg, "Given the same agenda, when [meetings are] given half as much time at the onset, they finish in half as much time! And the quality of the meeting is just as good." Meeting coordinators should also consider the time of days the meeting is scheduled to avoid as many deep work interruptions and time zone conflicts as possible. Notes should be recorded during the meeting and circulated or stored afterwards, especially if a decision was made. Attendees should have access to retrieve and review them later, if needed. Notes are useful not only for meeting attendees but also for anyone who can’t (or doesn’t need to actively) participate in a meeting. Those stakeholders can instead reference the meeting notes. Participants should know what their role in the meeting is, whether it’s to facilitate, weigh in on an area of expertise, take notes, keep the meeting on time (and on topic), or provide context on an agenda item. 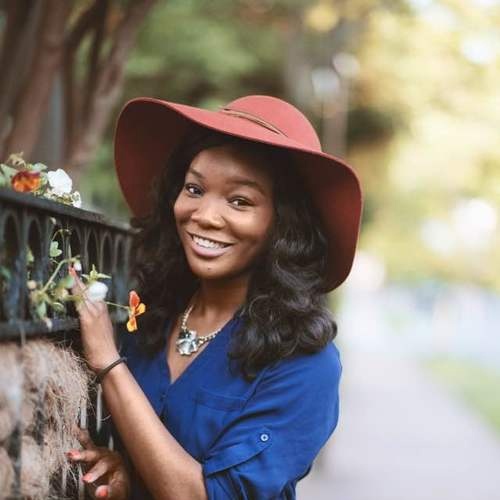 This not only allows participants to prepare in advance but forces meeting owners to determine exactly who is needed and why they’re needed, which will help avoid unnecessary participants. Think about unconventional roles, as well. Many situations will benefit from assigning roles like “devil’s advocate” or “customers” to drive engagement and improve decision-making. Before a meeting is over, be sure to recap and document any next steps and decisions that came out of the meeting. 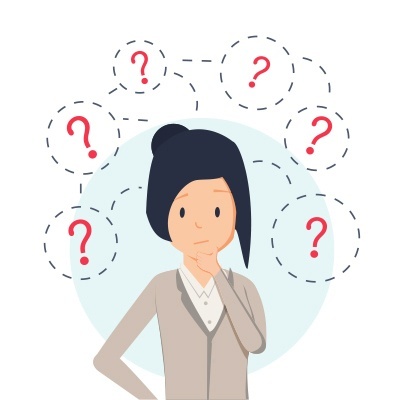 Reviewing a meeting’s outcome can clear up any confusion about ownership and accountability, giving an opportunity to confirm and correct any takeaways if needed. Implementing best meeting practices is only part of the solution. To really make meetings better, organizations should focus on developing meeting skills. Check in with employees on a regular basis to get their feedback on how productive meetings are. Are they too frequent? Could they be structured differently? To encourage deep work, businesses can designate one day of the week to be a “meetings-free” or “work from home” day. Meeting organizers can change the location of a meeting to a new environment to aid creativity. If deeper discussion is needed, meeting organizers can divide participants into small groups of eight or fewer. The facilitator can allocate a few minutes of meeting time for brainstorming. Walking meetings can increase engagement and creativity, though they should only be implemented with three or fewer people. Their close relative, standing meetings, tend to be shorter than sitting meetings. Whether you decide to implement some of all of these ideas, remember that the key is to ensure that all meetings have a valid purpose. Although these strategies can improve meetings, that only goes so far. Meeting managers need to evaluate if the meeting is needed at all. Meetings are great places for brainstorming and discussing nuanced topics. However, other activities like getting feedback on a report might be better-suited for asynchronous collaboration. Although they’re considered by many leaders to be a “necessary evil,” meetings don’t have to leave a bad taste in our mouths. The best and most successful organizations view meetings as a strategic resource instead of a mandatory burden. They can be used to solve problems. They can help build more competitive and better-run organizations. They can connect employees in an increasingly distributed and self-directed workforce. The next time you find yourself sighing over a recurring meeting invite, consider rallying the group or taking the lead to make the meeting better – it can be a powerful force for change.